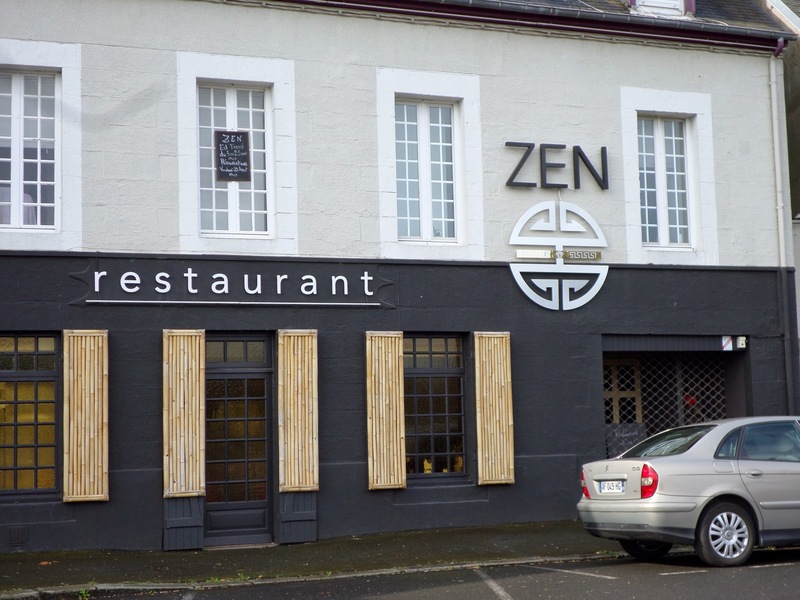 We set off from Saint-Brieuc on our way to our next port of call directly South towards Lac de Guarledan. As is usual, in any city of significant size, the hardest part is to negotiate the contra-flow system and avoid ending up on the motorway. Now, usually, this involves reversing and GPS-related swearing in equal measure on my part, and S walking her bike along the pavement at busy intersections, thereby making progress even more strained. However, with my new powers of Zen, it all went rather smoothly . . . and as if the conform this what did we pass on the way . . . Thereafter, we hammered it down the dual carriageway, with artics skimming our panniers . 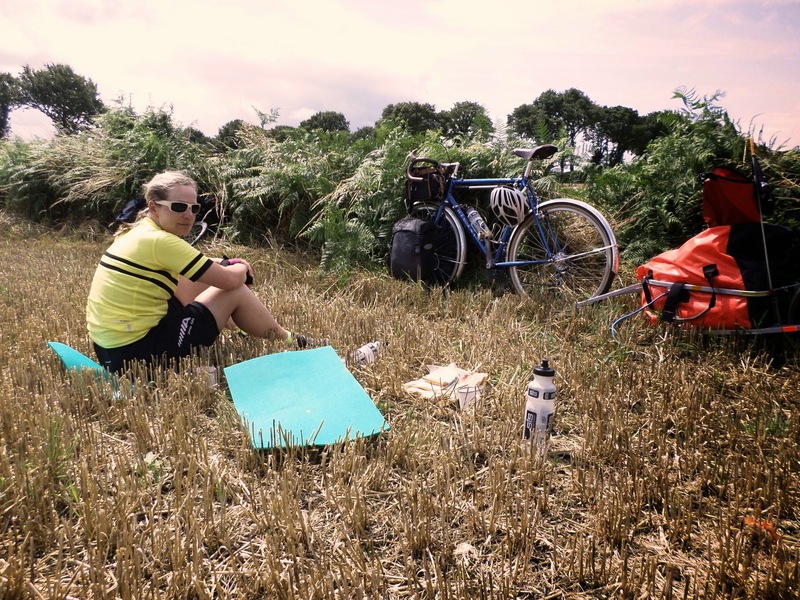 . . but respite was found for le déjeuner in a picturesque wheat field. Subsequently, S discovered what the ‘Mur’ in Mur de Bretagne means: regular readers know that I need say no more about it . . . I have already mentioned the Da Costa trailer, so named because I borrowed it from Mike Da Costa (thanks to Mike) for this trip. Now, it is really useful for carting the camping stuff down low to the ground, which makes the bike handilng much more predictable, and I constantly receive admiring glances from pannier-laden, lady cyclo-tourists following in the wake of their spouses – I like to think that it is my tanned and hardened athletes physique, but S maintains that they are, instead, fantasising about buying such a trailer for their husband’s next Xmas present. However, it’s crowning glory is that S calls it the ‘Great Equaliser’ – I can no longer speed away from her as in the carefree days of old, because the extra drag prevents me putting down my power sprint to create a tranquil distance between us when required. And, packed to bursting as it is with objects feminine, camping clobber, food, and dirty laundry, our daily distance is limited to 35-40 miles of ‘scenic route’. However, it seems that I have it easy. 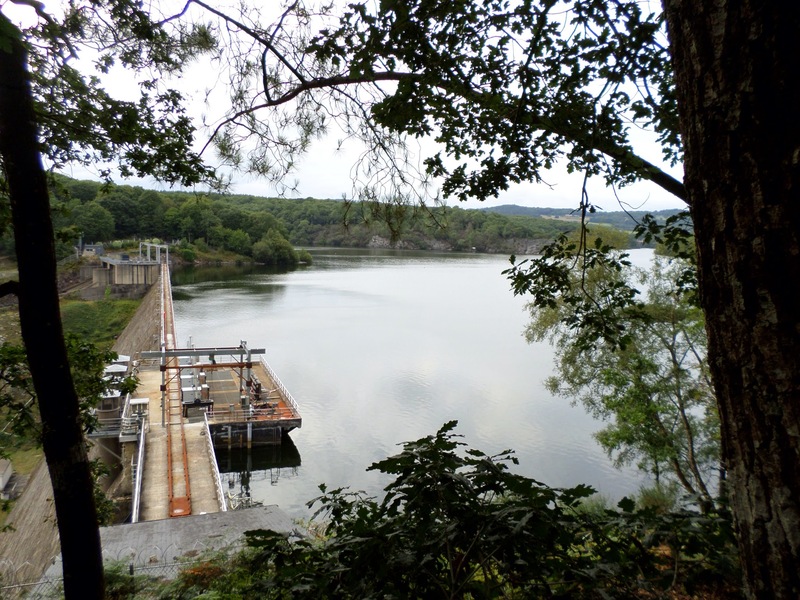 Today, shortly after we arrived at Lac de Guarledan on the Nantes-Brest canal, a family arrived en mass, parents and FIVE girls spaced in age between 14 to 4 years old, the older ones fully loaded with panniers on their own bikes, the middle on a pull-along, and the youngest in a kiddie trailer. Then later, another family arrived with a triple-trailer – Dad on his bike with a pull-long attached and a kiddie trailer attached to that, and. . . . wait for it . . . a dog in the front basket! And we thought we had it hard . . . I have done my good deed for the week though. This evening, another middle aged couple arrived en velo with exactly the same trailer . . . so I gave Mnsr some of my Intermarché washers to prevent possible derailleur misphap. So, we have gone for a walk around the Lac – well, as far as the dam – and I have treated S to a lentil chilli to scour out all the rich food of the last few days. This, you understand, is my careful forethought designed to ensure that we have to get up at least three times tonight to mitigate the effects of the hard gound after the softening up of two days slumber in comfy hotel beds with real pillows instead of stuff-stacks full of dirty laundry . . . I think of everything. 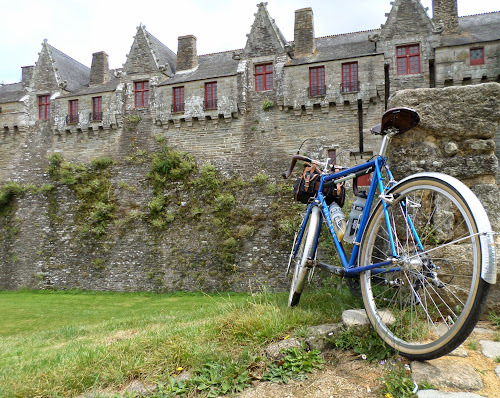 Day 10 was a trip to Pontivy, outward on the main road and return by way of the bike path along the Blavet. 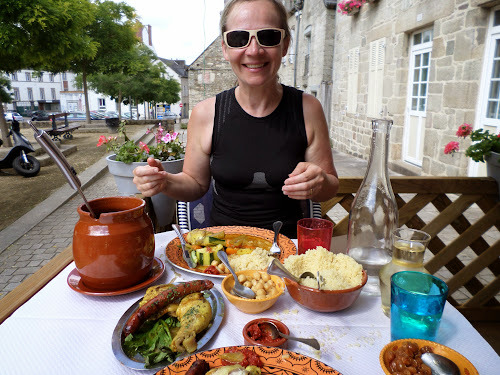 If you are ever in Pontivy I can highly recommend lunch at the Morrocan Restaurant near the church, a splendid feast of poulet and cousous, with legumes cooked in chicken stock and various other little bowls of chick peas, sultanas and chilli paste. Followed by cardamon ice cream, créme bruleé, and mint tea . . . I am thinking of changing the title of these posts to the ‘Dejeuner Diaries’.